This is a tasty looking Indian mutton recipe with peas. Boil the mutton pieces with salt and turmeric powder and set aside. Heat oil and add garam masala powder, onion, ginger garlic paste and tomatoes. Stir nicely and then add green peas. Cook together for a few minutes. Finally, add the pre boiled mutton pieces and mix thoroughly. I just love getting your original recipes and sharing them with others on the site, so feel free to send me your favorites. 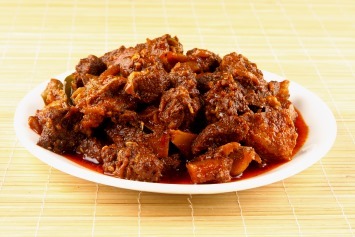 If you like this mutton recipe, look here for more Indian and Asian flavored recipes. You pour that in one vessel.now,in the mixing jar, you put 2 big tomatoes,or 3 small tomatoes, one big garlic(it means,10 slices of garlic in that),ginger(the measure of your small finger),one cinnamon,3 cloves,10 red chilies,required of salt,and grind it all…add this one to rice-urid flavour….stir both of them well…if you want to prepare dhosai now…in this flavour more sliced onion add for great taste.add coriander,curry leaves more….put a non stick pan on the stove ,pour the flavour….add oil,or ghee ….boil.it both of sides become golden color…..